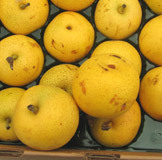 Asian pears are native to China, Japan and Korea. Expect to see bright green, pale yellow and russet brown varieties. Known for being quite juicy and crisp, Asian pears are mildly sweet and delicate in flavor. Their crispiness makes for a refreshingly simple dessert when chilled, then peeled and sliced, or add them to a salad for a sweet crunch. Unlike their European counterparts, Asian pears are ready to eat when picked. Though they are hard when ripe, they will bruise easily. They keep well under refrigeration far longer than most other fruit. Look for aromatic fruit in late summer through early winter.